Don Bosco Renewal Centre is situated in the south of Bangalore, on the outskirts of the city. Our house lies on a small side road (Kothanur Road) off Bannerghatta Road between MountSt. Joseph and the Convent of the Holy Spirit, about 15 Km from the City Railway Station and about 8 Km from the Bangalore Dairy Circle/ Dharmaram College. If you are coming by train, get down at the Bangalore Citystation and take Bus 365, 365D, from Platform 15 at the City Bus Stand (also known as Majestic) just opposite the Railway Station. 365 AC will charge you only Rs. 60. It can be taken near the Restaurant side. There are also pre-paid autorickshaws available from the RailwayStation; ask for Gottigere, which is beyond Meenakshi Temple or Royal Meenaksi Mall on Bannerghatta Road. When you reach the Temple (on your right) proceed to Holy Spirit School or Loyola School. 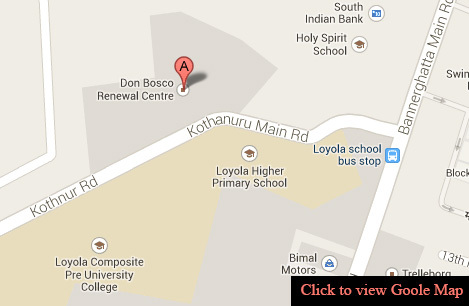 Take the Kotanhur Road (on the right) and proceed - you see our entrance marked “Don Bosco Renewal Centre”. The prepaid auto fare up to Gottigere is app. `315. Other auto rickshaws may demand 50% more than the meter charge. If you are coming from Kerala or Tamil Nadu, your bus will most probably stop at Bangalore Dairy Circle where you can catch any of the above–mentioned buses, and also Bus 368 which originates from Shivajinagar Bus Stand. From the Dairy Circle you can also get an auto-rickshaw to our place, but some of them may ask you to pay one and a half to two times the fare, thinking we are outside city limits. The amount for hiring an auto may work out to about ` 80-100. It is important to remember that the landmark on the Bannerghatta road to identify our area is Meenakshi Temple or Royal MeenakshiMall. Your auto-rickshaw driver should take you right up to your destination, and not let you off at Meenakshi temple. When you arrive at the airport take the airport buses No. 12 bound for Bannerghatta Road (Shoppers stop or Gopalan Mall) or No. 5 to Jayanagar. From these points you can take an autorickshaw to Gottigere and then proceed to our place. (as above).